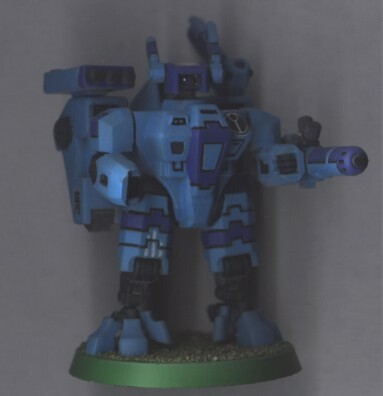 Warhammer 40k Forum Tau Online » Games Workshop/40K Related » Showcase » Crisis Suit, Fire Warrior and a Drone. Used a scanner, so sorry if they&#39;re a bit dark. Hopefully I&#39;ll get some good pics taken soon. Re: Crisis Suit, Fire Warrior and a Drone. The FW and drone look really good, but the crisis looks a bit flat, despite being painted in the same way. Try a simple highlight on the raised edges, and these models will look much better. However, the fact that the colour is nice and clean and flat makes them perfect for tabletop gaming. Have you thought about a contrast colour other than blue? Just for small sections here and there. Some colours that would look good with this are white and yellow. You could use red, but i find blue and red models to look a bit weird, but thats just my preference. 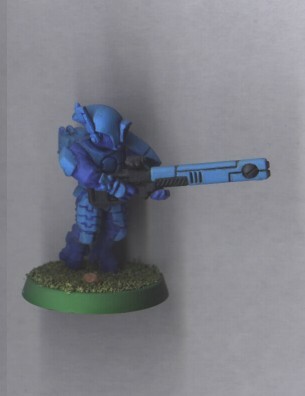 Judging from the pictures, have a look at the Ultramarines colour schemes for some ideas, as your blue seems to be failry similar (if not the same). looks like you used several blues but i think that the models are to light they some contrasting darker color, not a lot but some. The all blue look works, even without a contrasting color...I would, however, suggest that you vary the value of the blues you do have...they&#39;re a little too close in terms of scale...make one a bit lighter, or darker than the other, so the figures don&#39;t &#39;grey&#39; out on you...maker sense? That is some smooth painting, Maybe break up the blue with a white panel here and there ? Yeah, I&#39;m kind of grinding through these guys to get them ready for play, so I&#39;m taking some deliberate shortcuts. 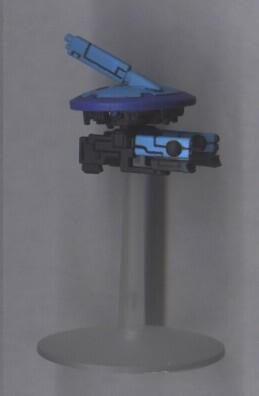 And that is Ultramarines blue, SynapsyS, good call. I&#39;ve got a few FW that have white lines like the details on the Crisis Suit&#39;s right leg, and a bit of decal work that isn&#39;t very apparent in the scans.